Japanese researchers have used one of the world’s most powerful supercomputers to predict the existence of a strange new type of particle. The proposed particle is composed of two baryons, rather than a single baryon like almost all the other particles in the world. Baryons are composite particles made of three quarks, as opposed to mesons, which are composite particles made of one quark and one antiquark. Both protons and neutrons, as well as other particles, are baryons. A quark is a subatomic particle — one of two currently recognized groups of fundamental particles — that represent the smallest known unit of matter. Twelve fundamental particles – six quarks and six leptons (the other type) – are the basic building blocks for everything in the universe. Both types of particles are distinguished in terms of flavors or colors, as they’re sometimes called. For quarks, there are six types of colors: up, down, top, bottom, strange, and charm. Most particles are made of just one baryon, except an outlier called deuteron, or heavy hydrogen. Such particles are called dibaryon particles, and now researchers at RIKEN’s Advanced Institute for Computational Science in Japan have predicted the existence of a second one. It took them three years of crunching numbers, working with an insanely fast computer capable of performing 10 quadrillion operations per second, to come to a result — that’s how computational intensive this kind of search can be. Running simulations based on quantum chromodynamics (QCD), the theory that describes quark interactions, the team eventually found a new tentative particle called di-Omega. The new particle ought to be composed out of two “Omega baryons” that contain three strange quarks each. “We were very lucky to have been able to use the K computer to perform the calculations. It allowed fast calculations with a huge number of variables. Still, it took almost three years for us to reach our conclusion on the di-Omega,” said Shinya Gongyo from the RIKEN Nishina Center. In the future, it remains to be seen if di-Omega is really a thing of reality. 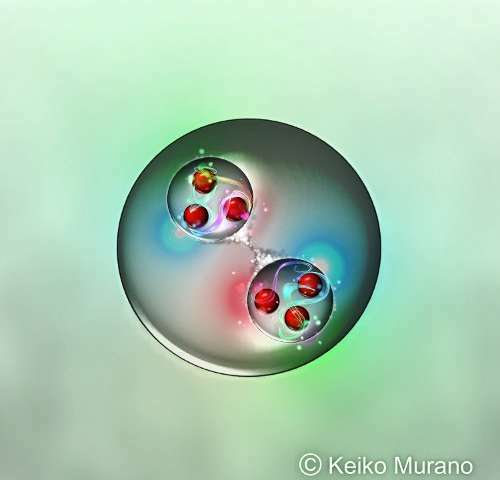 The researchers have already proposed a series of experiments with heavy ion collisions in Europe and Japan for this purpose. “We believe that these special particles could be generated by the experiments using heavy ion collisions that are planned in Europe and in Japan, and we look forward to working with colleagues there to experimentally discover the first dibaryon system outside of deuteron. This work could give us hints for understanding the interaction among strange baryons (called hyperons) and to understand how, under extreme conditions like those found in neutron stars, normal matter can transition to what is called hyperonic matter—made up of protons, neutrons, and strange-quark particles called hyperons, and eventually to quark matter composed of up, down and strange quarks,” said Tetsuo Hatsuda from RIKEN iTHEMS. Scientific reference: Shinya Gongyo et al. Most Strange Dibaryon from Lattice QCD, Physical Review Letters (2018). DOI: 10.1103/PhysRevLett.120.212001.